We are offering Designer Pendant Set. As an illustrious corporation of the industry, we are eagerly immersed in presenting a broad gamut of Designer Pendant Sets to our patrons. Check out this multicoloured pendant set that will lend a fashionable look to urban women. 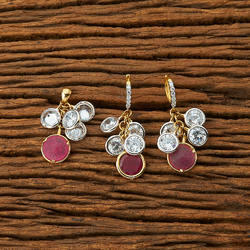 Embellished with stones, this pendant set will catch you at a single glance. Featuring gold finish, this set looks attractive. Made from alloy, this pendant set is durable and skin friendly. Team it with a matching saree or salwar kameez to look perfect. - A masterpiece of sorts, gives you the look of a pretty maiden attracting fluttering butterflies. A eyecatcher! This Exclusive Fusion Pendant Set has the greenish look and looks marvellous. 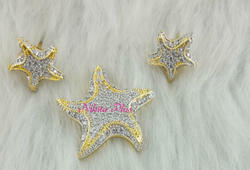 Being a prominent firm in this domain, we are engaged in offering a distinguished assortment of Diva Look Pendant Set.